Below is the transcript and links for the 7th Dispatch from the Endocene, which aired on Sunday, July 19. The podcast can be heard at the Extinction Radio website. My part begins at 1 hour 6 minutes into the broadcast. Many thanks to the hardworking producers, and all the other contributers, especially for the marvelous poetry from Rex Eagle and Benjamin the Donkey...enjoy! Welcome to the 7th Dispatch From the Endocene, and thanks for listening. Links to all the information I will mention will be found at the Extinction Radio website. There is never any lack of material when the topic is the staggering and accelerating loss of earth’s biodiversity. Much of it is directly due to hunting animals for meat or dubious medical purposes, and logging or other forms of habitat destruction for mining or agriculture. Less disruptive but perhaps more despicable, there is illegal collecting of protected species - for enthusiasts of plants like orchids, or tropical birds. One particularly sad episode was the discovery of 3,800 endangered Philippine forest turtles, found tossed in a cement tank in a warehouse. The turtles were in horrible dehydrated condition, the injured buried under piles of the dead. Rescuers were able to nurse many of them back to health and release them, but the episode highlights the nefarious activity of poaching for the exotic pet trade as another reason that wildlife is endangered. Another more elusive cause is no doubt anthropogenic in origin, but harder to trace directly to warming, to pollution, or disease. That would be incidents like the unexplained dieoff of sea stars up and down the west coast of North America, a tragedy which is updated in a well-researched and worthy article that I highly recommend. Another is the sudden and inexplicable desertion of their nests, by thousands of sea birds in Florida. Indeed, a new study reveals that globally, sea bird populations are down by an incredible 70 percent since the 1950’s, which doesn’t bode well for marine species in general. Yet another pressure on wildlife comes from competition with domesticated animals for habitat and food, which affects little vulnerable mammalian species such as the elusive, and adorably fuzzy Chinese Ili Pika. For a comprehensive, updated list of links to worldwide dieoff events, you could do worse that visiting end-times-prophecy.org. Even though they are religious fundamentalists they post exhaustive links to legitimate news stories. Probably anyone who knows anything about climate change has spent an annoying week swatting at the avalanche of news reports, most of them stupidly distorting recent research regarding sunspots. There is nothing in the research to indicate we are heading for a mini ice age, but you would never know it from the sloppy media coverage. Aside from that, the frenzy it stirred up reminds me once again that the environmental movement made a colossal mistake by allowing the debate over climate change to dominate research and activism. Not that CO2 isn’t the most important initial forcing greenhouse gas, or that climate change isn’t an existential threat. But the single-minded emphasis on that facet of overshoot has enabled deniers, both the idiot and the malicious types, to deflect any serious conversation about what underlies climate change. A similar question might be asked about ethanol and other biofuels, which also emit far more nitrous oxides, a precursor of ozone. And yet another question might be asked, but almost never is - How much is air pollution sickening wild animals, insects like bees, and plants and trees? For whatever complicated reasons, the issue of climate change seized the discourse decades ago, and ecology was left to the “softer” science of biology, a discipline looked down upon by physicists and atmospheric chemists. It turned out to be quite fortuitous for corporations that climate change dangers in the future are easier for people to ignore and for politicians to quibble over, than even more pressing concerns such as not having clean water, running out of fish, and forests being poisoned by ozone. There are still lots of climate and social justice activists who claim overpopulation isn’t a problem, even accusing those who are concerned about it of being racist. So with all this running through my mind it was a fun coinkydink that a friend emailed me an essay titled “Facts - The Coming Destruction of Civilization in the Very Near Future”. The author is named Jason G. Brent, and his website is jgbrent.com, where you can find more of his writings and a link to his book, called “Humans - An Endangered Species”. The way in which he examines this seldom-asked question probably derives from his background as an engineer, with degrees in business, and law. Mr. Brent looks at the compound growth of population and the economy and has discovered it will inevitably end in a disaster for humanity. It’s a sort of “do the math” for population similar to McKibben’s Rolling Stone article, Do The Math, for CO2 ppm in the atmosphere. He compares various UN population projections and relates them to two major, finite resources, essential to contemporary life. Oil, and fresh water, are both already severely constrained and about to become dramatically more so. This scarcity will have an increasingly devastating impact on human society, and he predicts civility will break down in horrendous ways should the human population continue its trend of compound growth. Ultimately Mr. Brent brings us to a point even more rarely considered, which is, when are we going to discuss coercive birth control? Is it better to hope that voluntary birth control will be sufficient, or leave reduction to be effected by resource wars, at least some of which will almost certainly deploy weapons of mass destruction, rendering swathes of the Earth irradiated? a) War, starvation, disease and other horrors. “Is there bread and milk on the store shelves? If so, everything is fine, so abortion and infanticide can be regarded as sins. Cut the food supply by 50% and watch the morality change”. My thought has always been that only coercive birth control will be effective, but it’s not worth pursuing because it will never be acceptable. Mr. Brent makes the case that even so, it must be put on the table, because the alternatives a and b are, respectively, unthinkable and highly unlikely to succeed. An interesting contrast to his position can be found in James Hansen’s 2014 Opinion paper, in which he promotes widespread proliferation of nuclear power plants. According to his analysis, the other so-called clean energy sources - wind, solar, geothermal and so forth - will be wholly insufficient to power modern society - and enable the people of developing nations to rise out of poverty which translates into greater consumption of energy and manufactured products. He went so far as to call the faith that green technology will save civilization a myth, and scornfully posted a clip from a post-Three Mile Island anti-nuclear protest with Ralph Nader and people promoting not only solar and wind, but also, wood-burning stoves and coal. He seems frustrated that the general public and the politicians pandering to their anti-science tendencies fail to accurately assess relative risks, noting that fossil fuel emissions kill far more people than nuclear ever dreamed of. In fact, a new study just emerged claiming that air pollution kills nearly 9,500 per year in London alone. And yet Hansen seems to have no cognizance that overpopulation is the root of our imminent reckoning with limits to growth. Perhaps he hangs his well-known hat on the notion that greater prosperity from nuclear power will lower the growth rate without any deliberate effort required, which is…another myth. There is a video on youtube that zooms in and out of a massively detailed NASA photograph of the Andromeda Galaxy. It’s truly beautiful and terrible that highly advanced technology has enabled us to see such a wondrous sight that we would never be able to view with the naked eye, although we might imagine it. The universe is so vast, that watching it I had to feel convinced that there must be many, many other planets where life has begun, and places where intelligent, sentient, sophisticated species have evolved - and then, as more and more planets and stars emerged from infinity I could only think that the solution to Fermi’s Paradox must be that sad, and paradoxically comforting notion, that by the time a species achieves the technology to travel or communicate through space, they will have run out of resources, and out of time. As we humans on earth are, for all but the shouting, out of our brief time here. If you want to keep up with all the bad news that Fox won’t tell you, check out the website Global Risk Report - which presents an excellent aggregate of the latest and most interesting articles, research, and blog posts about energy, the economy, and the environment. That’s all for this week, thanks to the producers of this show and especially to Mike Ferrigan, our founder, whom I will greatly miss. The entire west coast of North America is very hot and very dry, and there are a truly staggering number of wildfires as a result. 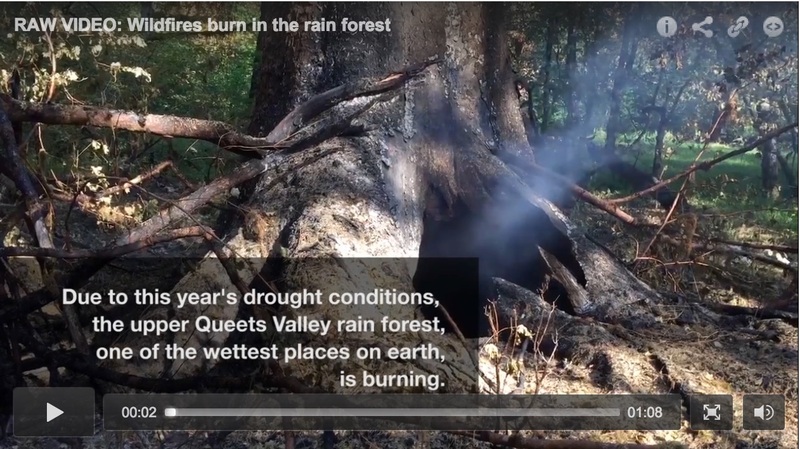 Still, it is ironic that you can see a news video like the one embedded in this Seattle Times article, "Burning Rain Forest Raises Concern About Future" - which begins with a shot of a huge old tree, smoke pouring out of a gigantic hole at the base. 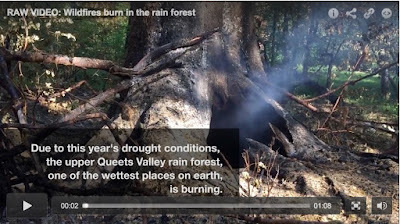 Obviously, the process of interior rot began long before this season's unprecedented drought and heat wave, and yet none of the firefighters interviewed seem to have any inkling that the forest has been dying for some years - not even the firefighter who says, a couple of minutes into the film, that the trees are rotted on the inside! It would appear that nowadays people think it is normal for trees to be rotten. Perhaps we will soon get used to regular reports of fires raging out of control, and people dying in heat waves. Hello Mike, and welcome, listeners, to the Sixth Dispatch from the Endocene. No sooner had I finished my last Dispatch, when immediately a new paper was released - which proclaimed that hey, there really IS a Sixth Mass Extinction underway or, at least, the beginning of one. This publication ignited countless sensational headlines, even in mainstream media, and other silly version at Motherboard/Vice - “We Are 100%, For Sure, in the Middle of a Major Extinction Event”! Probably anybody who is savvy enough to be part of the Extinction Radio audience is already aware of this research and its explosive impact in the past two weeks, but for convenience there will be links to some of the news articles and author interviews at the website, as for the other studies that will be part of today’s episode. The unusual hoopla may have come as a surprise to those biologists and ecologists who have been shouting from the mountaintops for years, even the authors, including Paul Ehrlich and Anthony Barnosky - that human overpopulation is outstripping the earth’s ability to provide resources and absorb pollution. 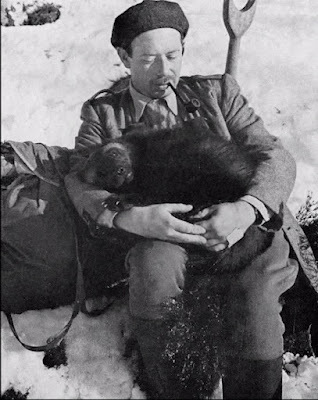 The primary warning - that humans are destroying essential habitat for other species, and hunting them to oblivion - goes back to ecologists like Aldo Leopold starting in the 1920’s, and even to Thomas Malthus over two centuries ago. Nevertheless this newest assessment, titled “Accelerated modern human-induced species losses: Entering the sixth mass extinction” subjected the data to rigorous analysis. In an effort to end criticism of biological alarmism, the authors used very cautious calculations to compare the prehistoric rate of extinctions for vertebrates with the current rate and found that, using the most extremely conservative parameters, it is now at least 100 times higher. There is doubt it is far worse than that, if only because there are so many insects and other invertebrates and plants for which there is little data or that haven’t even been discovered and named - tiny populations that inhabit such a rare specialized niche we will never even know they existed before they go extinct. I had to laugh at the absurdity of qualifying “mass extinction” with the word “true”. “True” as opposed to, what, a “phony” mass extinction? A “pretend” mass extinction? A “fantasy, only in your nightmares” mass extinction? Despite that cowardly disclaimer, the attention given their conclusions would seem to indicate their results hit a nerve within a rising crescendo of growing anxiety. Recently we have seen a slow collective awakening to overshoot and collapse that is reflected in contemporary literature, movies, and news about massive dieoffs that are becoming more difficult to avoid completely, because they are affecting a huge number of species, almost everywhere you care to look. This causes me to wonder how long it will before the climate and environmental activist communities are forced to stop blaming public ignorance and corporate manipulation of the media. What or who will they blame for the conspicuous lack of action, when it eventually becomes clear that people DO know humans are causing mass extinctions, as well as creating climate chaos - but we simply aren’t willing to give up the conveniences and luxuries of modern civilization…no matter how badly our own offspring will fare in the aftermath? Most people I come across don’t even bother with active denial, they simply ignore the warnings - because they understand at a visceral level, perhaps even better than scientists and green activists, that to "do something" about those problems would require a huge personal sacrifice, and nobody is willing to do that (not even the scientists and the activists). Nobody wants to give up lights, planes, iphones, electronic toys, reproducing, cars, and strawberries in winter. As for the billions of people that can’t access those options yet, they aspire to have them. And it is worth repeating that the sixth mass extinction is not being driven, at least not yet, by climate change. Speaking of having enough oxygen to support the life we know, you will find a link to new research that traces a serious depletion in the concentration of oxygen due to a variety of human activities, including producing fertilisers essential to feed the billions of people already on earth. One prominent scientist not associated with that Sixth Mass Extinction study we began with, but who has been in the forefront of extinction warnings over a very long and distinguished career, is Professor Eric Pianka of the University of Texas at Austin. He is one of the world’s experts on herpetology and an evolutionary ecologist, soon to be conferred the well-deserved title of Eminent Ecologist, by the Ecological Society of America, next month. He has had a fascinating career, doing extensive field work in the Great Victoria desert of Australia and the Kalahari in Africa. Some of you might recall a sordid episode in 2006 when Dr. Pianka’s acceptance speech upon receiving the “Distinguished Texas Scientist of the Year” award, was twisted out of all recognition and distorted to imply he favored a global Ebola epidemic, to cull the human race. If you missed it, the outlines of the controversy are actually a good introduction to his perspective, so a link about that, plus others to his writing will also be found on the Extinction Radio website. “For the first and only time in the long history of life on Earth, a product of natural selection has understood the process by which we became to be what we are: we actually learned to understand our hard-wired instincts and fathom our subconscious mind but we have failed to find the willpower to overcome those instincts. We also learned a lot about matter and energy, and even managed to date our cosmos. As a scientist, I treasure human knowledge. We got SO close, but then we blew it. Some think that intelligence inevitably destroys itself. 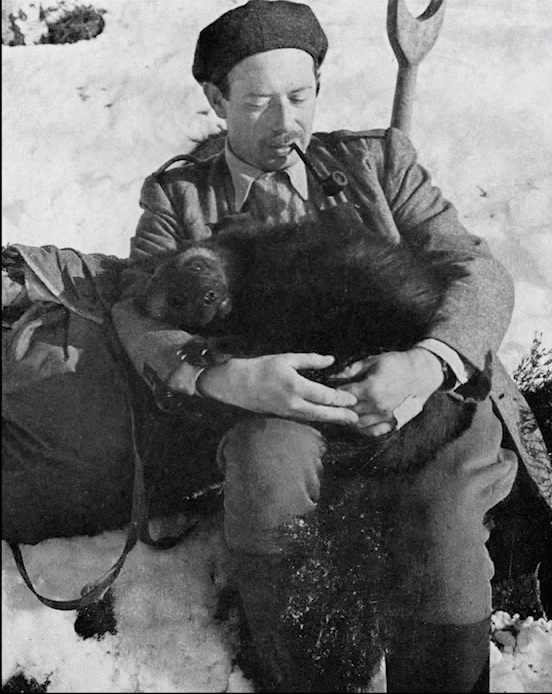 If you check out only one link I encourage you watch the youtube video where Dr. Pianka discusses and then reads James Dickey’s poem, “For the Last Wolverine”. It is a presentation filled with both love and grief that encompasses all the pathos implied in our battered world. The poem is even more heartbreaking for having been written in 1966. To see Dr. Pianka’s evident sadness at our failure to be stewards of the Earth brought to mind the original Wizard of Oz book, where all residents and visitors in the Emerald City were required to wear green glasses - because it wasn’t really emerald. Most people live their lives wearing the equivalent of tinted lenses, blinded to reality by believing in dreams and spirits, souls and immortality, irrational hope and denial. Once that layer of wishful fantasy is removed, it is common to experience profound despair and regret, and then, to attempt to find meaning amidst the spectacular and insane festering waste we have rendered our only precious, splendid home, Earth. Often the first reaction is an intense desire to do something about the impending catastrophes…and then finally, after a period of time, to realize there is nothing to be done. Often people are desperate to believe that there could have been better outcome, and so they blame capitalism or agriculture. From an article in the Washington Post about how we have exceeded boundaries beyond which the ecosystem can cope, I found this observation - “Humanity may have run into trouble with planetary boundaries even in prehistoric times, said Richard Alley, a Penn State geoscientist…The invention of agriculture may have been a response to food scarcity as hunting and gathering cultures spread around, and filled up, the planet, he said. “It’s pretty clear we were lowering the carrying capacity for hunter-gatherers 10,000 years ago,” Alley said." It's been about 15,000 years since we hunted the megafauna to extinction. We turned to agriculture, nearly simultaneously and independently all around the world, because of a continual process of overpopulation and migration, until eventually we filled even the most marginally habitable places and then overpopulated them as well. In order to survive, people started to grow food and domesticate livestock. We can no more divest ourselves of that proclivity than we can shed mysticism and the use of tools, language, symbols and expressions of art. The people who began agriculture no more knew (or cared) that it would ultimately devastate ecosystems than the hunter/gatherers knew (or cared) that they would eat dozens upon dozens of slow-moving tortoises, flightless birds, and large herbivores to the point of extirpation. Similarly, most people now are still blissfully unaware that we are in the midst of the sixth mass extinction, and that humans are causing it. "...forgive them; for they know not what they do." Personally I find a lot of comfort in the philosopher Camus. Life is absurd; it has no intrinsic meaning; so make your own. I should add - dance, dance, dance, and sing. Kiss the sky. Hug your loved ones. Bear witness to the fleeting beauty that still lingers on our blistered planet. Spare some time to admire the trees, being choked and poisoned by atmospheric toxins. And thanks for listening to this Dispatch From the Endocene. http://advances.sciencemag.org/content/1/5/e1400253.full extinction paper by Gerardo Ceballos, Paul Ehrlich, Anthony Barnosky, and others. 2014 study by Jurriaan M. de Vos in Conservation Biology, "Estimating the Normal Background Rate of Species Extinction." Following is the transcript for my Fifth Dispatch from the Endocene. The Extinction Radio Link is embedded at the end, where my segment begins at 1:29 minutes in. The next installment airs Sunday, July 5. Thanks to all the producers and contributers for a truly unique show! Greetings listeners, and welcome to the fifth Dispatch from the Endocene. I want to thank Extinction Radio for hosting another episode on their website, where they will be posting links for further reading on the topics in this segment. Last week I said I expected to be talking about the ghastly moose situation, but since then a couple of other things seem more dire unless, of course, you are a moose. Still, I’ll save them for another time. One thing is certain - there is no lack of material when the subject is the spectacular ongoing crash of biodiversity on planet Earth. That is, for anyone who is the least interested, and unfortunately, most people aren’t. If you are still listening, you are in a very tiny exclusive cohort. After a four-year review, the US Fish and Wildlife Service has confirmed this week that the Eastern Cougar, also knows as a puma, or panther, is officially extinct. This is felicitous, because it lightens up the load on the burgeoning endangered species list. It has been eighty years since the last known specimen was killed in New England, so what took them so long to declare it extinct? And what does that have to do with calculating the number of species that are going extinct today - and how massive is the 6th mass extinction, really? “Furthermore, with the expansion of human populations into new habitats, new infectious diseases have emerged that have real or potential consequences, not only for humans, but also for many other taxa, such as the case of Bd and amphibians. Perhaps the most profound impact is the human role in climate change, the effects of which may have been relatively small so far, but which will shortly be dramatic (e.g., in the sea). Research building on the Global Amphibian Assessment database showed that many factors are contributing to the global extinctions and declines of amphibians in addition to disease. Extrinsic forces, such as global warming and increased climatic variability, are increasing the susceptibility of high-risk species (those with small geographic ranges, low fecundity, and specialized habitats). Notice the emphasis on the oceans, in a paper written almost ten years ago - and voila here we are with news of massive die-offs in the Pacific grabbing the headlines, such as an article from the Seattle Times declaring “Toxic algae bloom might be largest ever”. That story quoted a scientist who said, quote, “The fact that we’re seeing multiple toxins at the same time, we’re seeing high levels of domoic acid, and we’re seeing a coastwide bloom — those are indications that this is unprecedented.” unquote. So the fish and shellfish are being poisoned, and so are animals that eat fish like sea lions and birds. The coast has been closed for harvesting clams, geoduck, scallops, mussels, oysters and others. The article mentions nutrient availability, much of which is from sewage, agricultural fertilizer run-off, and nitrogen deposition from burning fuel. However, another insidious influence wasn’t mentioned, even though it was made famous in research published back in 2001 by Jeremy Jackson and numerous co-authors. Let’s take one example from the paper that describes the knock-off effects of human hunting. There’s not much to add other than to repeat Pogo’s trenchant observation as he surveyed a cartoon landscape for the first Earth Day in 1971, a vision the Pope now refers to as “an immense pile of filth”, which was that “We have met the enemy, and he is us”. Thanks so much for listening to another Dispatch from the Endocene. I’ll be back next week with another, maybe.